… with Hot Fudge Sauce and Bourbon-Vanilla Bean Whipped Cream. It’s a mouthful. On all accounts. Josie‘s choice for this week’s Project Pastry Queen challenge was a reminder of one of the main reasons that I love this cookbook so much: big, over-the-top, show-stopping desserts. And this banana cream pie doesn’t disappoint. There’s the flakey crust, a thin layer of chocolate, a thin layer of peanut butter, a killer banana custard filling, and fresh bananas. And that’s just he pie. Then there’s a bourbon chocolate sauce and fresh whipped cream. And let’s not forget the chopped peanuts! I’m not a huge banana pie fan – I like them – but I thought this pie was insanely good. The custard filling, with a few changes, is going to make a killer banana pudding – I can’t wait to make it again! – I put the fresh banana slices on top (not on top of the peanut butter layer). I knew there’d be no way that I could cut a clean slice with bananas on the top and bottom. – I bypassed the heating milk/vanilla bean pod step in favor of just using vanilla bean paste in the filling – because everything looks better with pretty flakes of vanilla bean. And it saved a pot. – I substituted half of the flour in the crust with whole wheat pastry flour. – I replaced 2/3 of the milk in the custard with yogurt. – I put bourbon and vanilla bean paste in the whipped cream. Because everything is better with bourbon and vanilla bean flecks. – I shoved the finished pie in the freezer for 20 minutes and then in the fridge. Because I was really bummed when I realized that there was an overnight step when I had my heart set on pie for dessert Thursday night. It was a late dessert, but we still had dessert! A big, stretchy waist pants thank you to Josie for picking such a fabulous dessert! Check out the other Project Pastry Queen members to see their take on the banana pie. Next week will be lighter, we promise, with a Texas twist on Crab Cakes. That looks delicious! I love chocolate, peanut butter and banana together! Hi…linked here from Claire’s blog and wanted to say hello! I really enjoyed visiting and plan to keep following. I always like finding other Texas bloggers…what part of the state are you in? I grew up in a small town between Houston and Galveston, but I live in San Antonio right now. I love PB and bananas together…toss in some chocolate? Even better!! @Wendy (The Weekend Gourmet), We just recently moved to the west side, almost to Katy. I grew up in Alvin, and all my family still lives there. Oh wow. 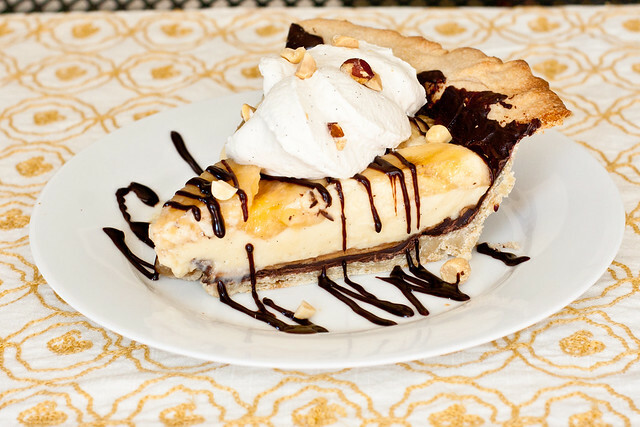 I’m a fan of anything banana and chocolate…but in pie form? Your presentation is beautiful! That looks fantastic! I cannot wait to finish mine! This may be over-the-top…but in the best possible way. Can you go wrong with peanut butter, hot fudge and a super flaky crust? I think not. This is amazing in every single way. Bananas and peanut butter make a lovely combination, but when you add chocolate to the mix it just steps it up to a whole new level! Love! That looks amazing! Is there any way you can share the recipe? I’m dying to try this! This looks and sounds amazing! As a child, I love peanut butter and banana sandwiches, so I’m pretty sure I’d love this too. Yum! It looks delish!! Great job! It really looks so tempting..
Looks absolutely wonderful! Great flavors in this! Especially the bourbon whipped cream!